Expand your arsenal of Little Reader Lessons! With Category Packs for Little Reader, you can add to your child's Little Reader lesson categories with BrillKids-quality media in different subjects and themes! 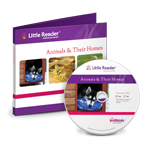 Get more high-quality lesson categories for your Little Reader program! Want to get more lessons in specific subject categories for your precious little learner? Get these Category Packs for Little Reader and expand your library of things to teach! More Category Packs for Little Reader are coming soon!